NOTE: High Pressure Sodium lamps are steadily being discontinued and becoming less common. Please consult the factory for availability of High Pressure Sodium models. Techlight’s line of high bays was designed for general manufacturing, warehouse, retail, assembly lines, or production environments. Heavy duty die cast aluminum housing with a white polyester powdercoat finish. Acrylic refractor and adjustable collar assembly. ETL and CETL Listed. A Super Durable Polyester powder coat finish is electrostatically applied in our state of the art paint facility. Standard colors available: White. Custom colors1 available upon request. The acrylic refractor reduces shadows and provides uniform distribution. Made for low to medium mounting heights. Available with a 16” flat glass lens, drop lens, or conical lens assembly. 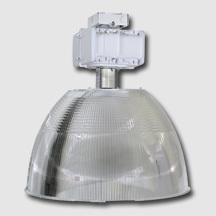 Available in 250W thru 1000W standard metal halide, pulse-start metal halide, and high pressure sodium. Comes standard with a 4KV pulse rated mogul base socket. Each 60HZ CWA multi-tap2 or 480V ballast is pre-wired and installed for convenience. Splice box for direct hard wire, hook, cord, and plug assembly, or pendant mount.